Tourists gather at the bow of a whale watching boat to catch a glimpse of a Sperm Whale off Kaikoura on the South Island of New Zealand. Many people that visit Kaikoura on the South Island of New Zealand venture out with Whale Watch Kaikoura to catch sight of a Sperm Whale or two. 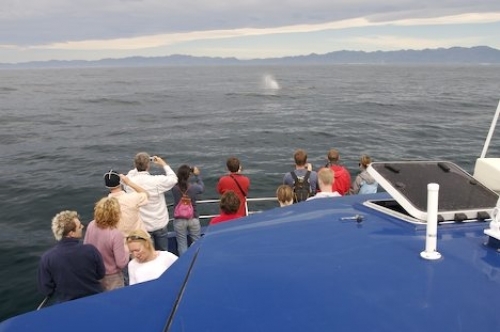 As these people on this whale watching tour gather to the bow, they spot the mist from the blow of a Sperm Whale. Cameras are clicking everywhere and binoculars are pulled out as the Sperm Whale surfaces. The noise from the blow of the whale is quite loud and is usually the first thing that one sees when looking for Sperm Whales. One single stream is seen above the surface of the water and it can reach heights of 50 feet as the Sperm Whale is a toothed mammal which means it only has one blow hole. Patience is highly recommended on this whale watching tour as you must wait for the whale to approach closer to the boat or to resurface once it dives below the surface again. As a Sperm Whale begins a deep dive, the tail fluke is lifted quite high out of the water and people aboard this whale watching boat are once again ready with their cameras. Photo of the blow from a Sperm Whale on a whale watching tour in Kaikoura on the South Island of New Zealand. A Sperm Whale is known as one of the deepest diving mammals throughout the world and an average dive can be about thirty to forty-five minutes long. Once the Sperm Whale dives, you have to scan the waters off Kaikoura as one never knows where the whale will resurface. Whale Watch Kaikoura is a highly respected Company that takes visitors into the natural habitat of the Sperm Whale and relates information of these magnificent mammals. There is a variety of other wildlife that lives around Kaikoura on the South Island of New Zealand, so one should always have their eyes peeled while aboard this whale watching boat. Whale watching tour with Whale Watch Kaikoura, Kaikoura, South Island, New Zealand.